Fan Expo Vancouver returns to the Vancouver Convention Centre April 18th to April 20th bringing with it celebrity guests, your favourite writers, actors, and more. This comics, sci-fi, horror, anime, and gaming show – expected to draw 25,000 fans – is packed with industry professionals, sketch duels, cosplay, workshops, and plenty of opportunities to shop. Attendees at Fan Expo Vancouver have many reasons to line up to meet John de Lancie, as the versatile actor and producer has been a part of some of the most memorable franchises in television. Best known as “Q” in Star Trek: The Next Generation, Star Trek: Deep Space Nine and Star Trek: Voyager, de Lancie has also had roles in Stargate SG-1, Breaking Bad, The Mentalist, and even My Little Pony: Friendship Is Magic. In 2012 de Lancie produced Bronies: The Extremely Unexpected Adult Fans of My Little Pony (formerly titled as BronyCon: The Documentary). The film centres on bronies, the adult fans of the 2010 animated television series, My Little Pony: Friendship Is Magic in which John de Lancie voices the character “Discord” — a mischievous chimera type-creature with powers, whose tomfoolery is reminiscent of de Lancie’s “Q”. He says he’s a obviously a big booster of the culture that has erupted around this incarnation of the My Little Pony franchise. A Vancouver connection there is that Ashleigh Ball, from the band Hey Ocean! is the voice of “Rainbow Dash” in the same My Little Pony series. No stranger to our fair city, de Lancie has also visited often in the last few years to either do filming or visit his son who attends school in Vancouver. Over the next few months he will be working with playwright Rajiv Joseph, who was a finalist for the Pulitzer, and he’ll also be heading to Tahiti to sail his boat 6,000 miles back to the US. Following those adventures he plans to work on a project that pertains to Syria, in particular the displacement of young people. 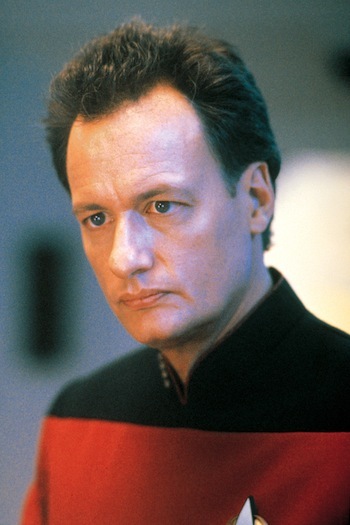 This weekend you can catch the fascinating John de Lancie at Fan Expo Vancouver as he will be available for autographs and photo ops, which you can purchase online in advance or in person. Tickets: Premium Package $99, Deluxe Weekend Pass $69, Friday $20, Saturday $35. You can also book your photo ops with your favourite guests in advance online. Karl Urban (Star Trek), Lauren Cohan (The Walking Dead), Bruce Campbell (Army of Darkness), Stephen Amell (Arrow), Robert Englund (Nightmare on Elm Street), Giancarlo Esposito (Breaking Bad), Stephen Amell (Star of Arrow), Eliza Dushku (Angel; Buffy the Vampire Slayer; Dollhouse), Michael Rosenbaum (Smallville), John de Lancie (“Q” from Star Trek: The Next Generation), Tom Felton (Harry Potter), Billy Boyd (Lord of the Rings) and many more. Check the guest list online for the latest announcements and follow Fan Expo Vancouver on Facebook and Twitter for more information. Oh man, I wish I could go! What a great looking guest list!